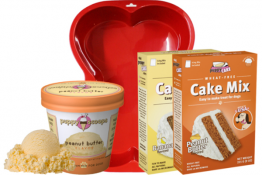 Pet Clearance: 52% OFF ChatterBowl Talking Dog Bowl, Toys, Treats and More! 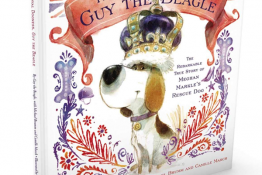 I spotted several new pet deals today over at the Clearance Section of Doggyloot.com! You can snag the ChatterBowl, recordable talking dog bowl for just $15.99 including free shipping ($33 reg). Other clearance items include dog toys, shirts, treats from The Real Meat Company and more at 48-62% OFF regular prices! Non-clearance items from the Daily Pet Deals section are also on sale and include a pair of KONG Snugga Wubba dog toys at $12 ($21 reg) and a pack of 10 low-odor Bully Sticks for $18 ($43 reg). All pet deals include free shipping unless otherwise noted! 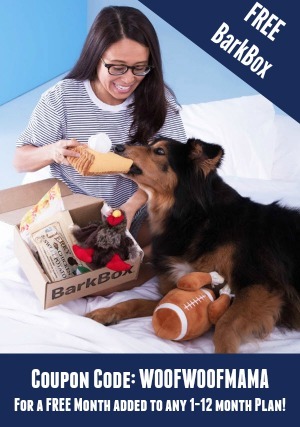 Be sure to signup for the Doggyloot daily pet deals newsletter so you’ll be the first to know about new deals from big name brands and small boutique shops, too! It’s one of my favorite sites for finding deals on stuff for Daisy and gifts for her pals! 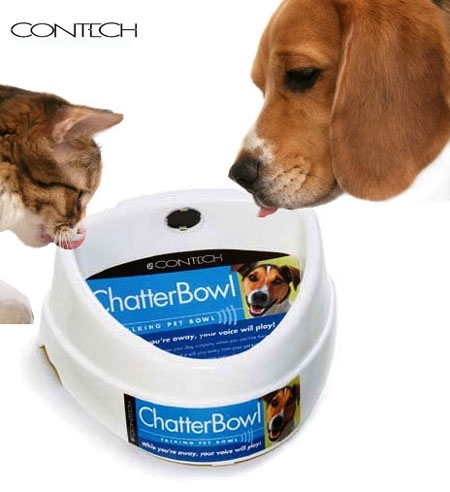 Get 60% Off the regular price of this Contech ChatterBowl Talking Dog Bowl now just $9.99 plus $2.99 shipping (reg. $24.99)! The ChatterBowl is a high-quality food bowl that records your voice, and plays it back when your pet approaches. 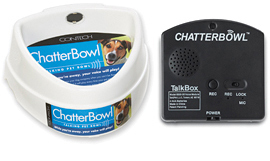 Just record your message (up to 10 seconds) and the ChatterBowl’s electronic Talkbox will sense your pet approaching and play your voice whenever your pet comes to eat or drink. Ideal for free feeding or as a water dish, the ChatterBowl helps keep your fur kids company, even when you’re away from home. This would also make a very cute gift idea! 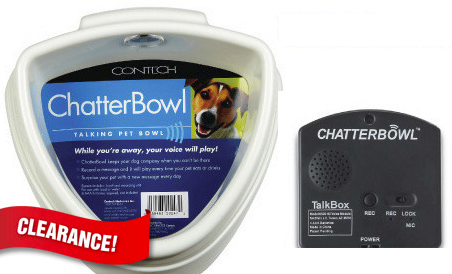 Save 52% on ChatterBowl Talking Dog Bowl Only $11.99 Plus Free Shipping Eligible! I found two great deals today on this ChatterBowl Talking Dog Bowl, so I’ll tell you about both in case one sells out first! The ChatterBowl is a food bowl that lets you record a message for your pet and then plays it as your pet approaches. Just record your message (up to 10 seconds) and your voice will play whenever your pet comes to eat or drink. Ideal for free feeding or as a water dish, the ChatterBowl helps keep your fur kid company, even when you’re away from home. The TalkBox records your voice, and plays it back when ever it detects your pet approaching. The TalkBox recording is triggered by changes in light detected by the unit’s photoelectric cell. You can snag the best price around at Amazon , which has the ChatterBowl for only $11.99 which is 52% Off the list price of $24.99. You also get Free Shipping with Amazon Prime/Mom/Student Membership and the item is also eligible for FREE Super Saver Shipping. Read my recent post to learn How to Get Free Shipping on Just About Everything at Amazon. 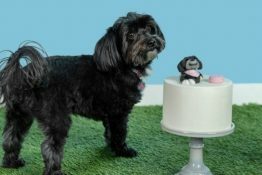 The other site with a good deal on ChatterBowl is DoggyLoot. They currently have this talking dog bowl for $18 Including Shipping. 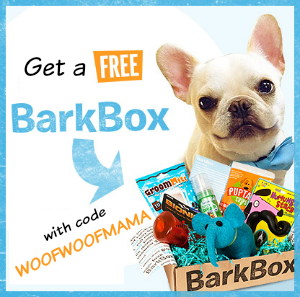 Join For DoggyLoot from this link and receive a $5 Instant Credit which can be applied toward your first order, so that would make the ChatterBowl only $13 Shipped for new members!